The way things are going these days, it’s tough for some families to afford a trip to the movies. 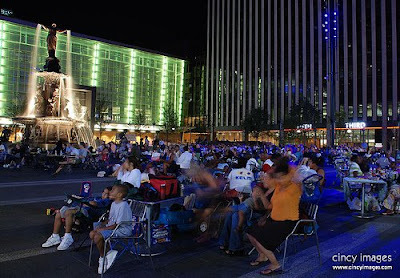 Luckily, in addition to the family-friendly movies every Saturday on Fountain Square (at 7 & 9pm), the Cincinnati Parks Foundation has been showing family friendly movies in our parks all around the Cincinnati area. Forget paying to see a movie and having to buy overpriced concessions, there are great movie options literally in your backyard! All movies start at dusk and will have concessions available. If you are looking more for musical fare, the 16th annual “Its Commonly Jazz” series is being kicked off this week at Eden Park in Mt. Adams. Since I’m not really familiar with jazz and we have been provided with a relatively cool summer thus far, these concerts are a great way to get a free introduction. The website is billing this event as “staying green”, but it’s not clear whether there is an actual intent to have eco-friendly anything or if it is just a play on words since all events are outdoors. From what I understand, you can bring a picnic to enjoy while watching the music, but I am not sure whether alcohol will be allowed. The website gives good background on each of the performers, but seems to be a bit underdeveloped beyond that. Maybe the economy has made the local government and parks board boost these kinds of outdoor events, or maybe they are just better publicized these days, but I hope they keep it up. Hopefully as more people get out of doors and enjoy our local parks they will better appreciate the wonderful parks system we have and the great amount of forethought that goes into the planning of the events that are planned in them. Many people do not know we have one of the top parks systems in the nation, and these events are a great way to get out and enjoy them for free!